Another minesweeper seen today was HMS SHOREHAM, the last ship in the 'Sandown' class of the Royal Navy. 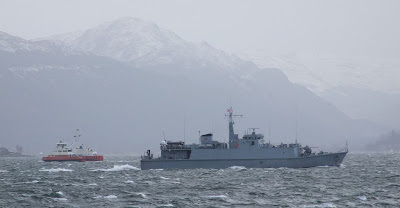 Joining the Navy late in November 2001, SHOREHAM is based at Faslane, although she spent several months last year on operations in the Mediterranean Sea. These 52.5 metre long, 600 tonne ships have a high degree of manoeuvrability, provided by Voith Schneider propellers, with Schottel bow thrusters.